Browsing articles tagged with " lost highway"
Compton, California (March 26, 2015) – 4 Wheel Parts, the global leader in truck and Jeep aftermarket and performance products and installation, is partnering with promoter SGE Entertainment to sponsor the Lost Highway Motorcycle Show & Concert. Parent company Transamerican Auto Parts (TAP) has finalized an agreement with SGE Entertainment that names its subsidiary 4 Wheel Parts as one of the official sponsors of the May 30 festival. 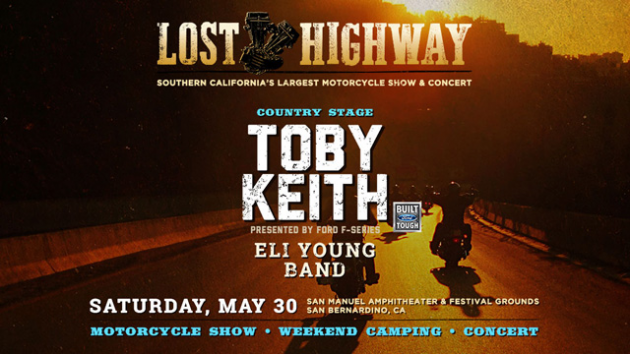 Held at the San Manuel Amphitheater in Glen Helen, California, Lost Highway features stunt performances, motorcycle builders, parts, accessories and gear vendors along with a music concert presenting a lineup of rock and country acts. Renowned, retired X Games motorcycle racer and owner of Las Vegas-based Hart & Huntington Tattoo Co., Carey Hart will also appear at the festival. Recognized as Southern California’s largest motorcycle show and concert, the Lost Highway Motorcycle Show & Concert is estimated to bring in a crowd of tens of thousands of music fans and enthusiasts of everything motorcycle and automotive to the San Manuel Amphitheater. Country singer-songwriter Toby Keith will headline the show and the Reverend Horton Heat, Social Distortion and the Eli Young Band are among acts scheduled to perform. The 4×4 and off-road crowd has an affinity for Keith from his starring roles in Ford truck commercials and his penchant for driving Ford trucks. Lost Highway tickets went on sale last Friday, March 20. In its Southern California locations and on its Facebook page, 4 Wheel Parts will feature ticket giveaways to promote the festival. Additionally, 4 Wheel Parts will be among vendors displaying and retailing aftermarket parts and accessories for trucks, Jeeps and 4x4s. Transamerican Auto Parts. We Sell It. We Own It. We Live It. 4 Wheel Parts is the global leader in off-road, truck, Jeep and aftermarket performance products. With 69 locations across the U.S. and Canada and growing, 4 Wheel Parts Service Centers install all the products they sell. Maintaining the nation’s largest inventory of off-road products like wheels, tires, lift kits and 4×4 accessories, 4 Wheel Parts serves customers across the country and around the globe. Life is Better Off-Road™. Visit them at 4wheelparts.com or call toll-free 877-474-4821.